A friend of mine recently bought a house and was desperate to cover up the eye sore of a fireplace in the corner of her living room. Luckily she’s an artist and was able to come up with a really creative way for how to update a brick fireplace, without having to paint it. Personally I’m not a fan of painted brick but I loved her solution: concrete stain. This is super easy DIY project to update a brick fireplace, and it only takes about an hour to do two coats AND complete the whole project. Step 1: Pour concrete stain into the tray and using the roller paint the stain on the walls. Press lightly so that the roller doesn’t get down into the grout. Brick is very porous so it will absorb the stain quickly. Step 2: Once the walls are stained use a paint brush to paint the stain onto the bottom bricks. Using a brush the same width of the bricks will keep the stain from dripping down into the grout lines. Step 3: Let the 1st coat dry and then apply a second or third coat until the stain reaches the richness of color that you desire. Are you ready to see my results? Here’s the before. Doesn’t it look awesome?! Staining brick is quicker and easier than painting brick and it gives you such a beautiful result! Click here to see how a bunch of my readers managed to update their brick fireplaces! Can you please find out what the color of the stain used in the very bottom picture is? It’s the caramel colored fireplace. Do you happen to know? Thanks so much! I love that color!! She actually used the same stain that my mom and friend did! The color is Loden, it looks different on each of the fireplaces because each of them started with a little different colored brick. If you stain yours I’d love to see before and after pictures! Hi, Isael! I’m Anna’s assistant, Bethany. Yes, the stain used was Loden. Just bear in mind it looks a little different with each fireplace depending on the color brick you start with. Hope this helps! Absolutely! It’s concrete stain so it’s made for outdoor use!! Can I stain the outside house brick and mortor lines with the same stain. Im trying to update our older house. I am so excited to find this post! My husband and I have been looking at our ugly yellow and black bricked fireplace since we moved in 10 years ago. Everything was either too expensive or too drastic. We’ll be trying this sometime this month and I’ll make sure to post before and after pics. I can’t wait to get started on this! Thank you so much for the idea. If the brick has already been painted, how did you go about staining over it? Or did you have to first remove the paint? If you had to remove the paint, how was that?? I saw in some of the photos, some of the bricks had been painted white, but there wasn’t any mention of that being a problem? Thanks! Sorry I’m just getting back to you! I think staining over the paint would be fine. Depending on the color of the paint it might even give you a darker, more modern look. If you wanted to go through the hassle of removing the paint you could but I think it would be more work than it’s worth. I hope that helps. 🙂 I always love to see “after” pictures so if you end up using this technique I’d love to see the finished result! Amazing!! Your fireplace looks fantastic! You used wood stain? How is it holding up? 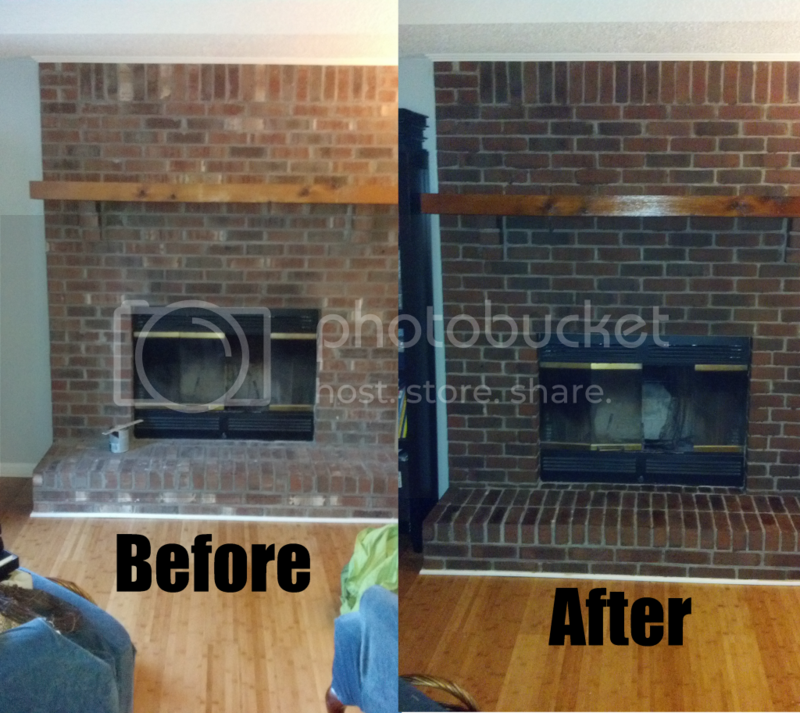 I’d love to update our fireplace – without having to cover the brick! Can you tell me what brand and color wood stain you used? The stain is holding up fantastically! It’s been about a year since I did it and it still looks great. I can’t remember the brand of stain I used but it’s in a yellow can with black writing. You can purchase it at any Lowe’s or Home Depot. We’re pulling up our carpet this weekend and putting in our floors – so it’s the perfect time for me to stain our fireplace! One last question for you – do you use your fireplace regularly? I’m just wondering if the stain has any reaction to the heat. Hi, thanks for this tutorial, we recently purchased a home with a very old looking fireplace with dingy bricks and I would love to update its look by staining the bricks! I just have two questions, in the picture the can of stain says semi transparent, Ive also seen concrete stain in solid..so we need the semi transparent one? Also, you mention first using a roller and then a brush, can we just do the entire thing with a brush? Thanks so much Anna! And do you think it will still look good if I dont choose a “brick” colour, but change it to either white or a light gray? And if I did do white/gray, should I also paint the lines between the bricks? Hi Anna – I would also like to change my red brick trim on driveway to gray without a “painted look”. Do you think a couple of coats of HomeDepot concrete stain would suffice and should I use their bonder first? Thank you. Hi Anna! Thanks for osting this, I am going to do tomorrow, I kept looking at painting our fireplace until I saw this… this is great! How do I stain a darker brick to match a lighter brick? Hmmm, good question. You could try acid washing it to lighten the brick and then re-staining it to match. I’ve never had experience with this before but that’s where I would start. Hmmm….this is intriguing. We’re about to buy a house with a massive 70’s brick fireplace. I like this solution, except that the mortar on THIS fireplace is black. No matter how I stain the bricks, the mortar will still be black. Makes for a very dark massive thing in an already dim room. I wonder if I can just paint the mortar, and then stain the bricks…. I think this is my solution. Just inserted a beautiful Jotul wood insert. The brick, however, looks like something from the Brady Brunch. Do you paint the entire wall first so the grout gets a new neutral color then do the bricks? Or did you leave mortar/grout alone and handpaint each brick. I want a mixed combo of red intensities and grey. Do you vary color with different colors or do repeated coats to darken? I did this and I am beyond thrilled with the results! The folks who lived in my home before must have tried the white wash or something; whatever they did, it did not go with my theme for the house now. The stain I used is from Lowe’s, Olympic Maximum brand in the darkest stain I could find – Canyon Brown. If html is not allowed, click the link to see. Seriously stoked with how it looks now! Such a great finished product. I think this is just what my fireplace needs to give it that new look. Anna, great post! Do you have any advice on painting the metal doors surrounding the fireplace? Our brick is nice but the door enclosure is an out-dated gold/copper color. I’d love to paint it black but didn’t know if this is possible or if that would have any sensitivity to heat. Any thoughts? Yes you can paint the brass on your fireplace! We did it. You just use Rustoleum High Heat paint (also comes in a spraypaint). Can find at HD or Lowes! Do you know if this would work on exterior bricks of a home? Sorry to bug you….b patio floor brick has lost its color..will this work?? Yep, it will work on any kind of brick. If it’s on the patio though I would seal it when you’re done, so it keeps its color longer. Our home has brick floors throughout and they have a slight shine to them so I’m assuming they have been sealed. Would staining them work, would you think? I would love to stain the floors a darker deeper color through the house! Thank you! Yes, you can absolutely use it on the outside of your house. It’s concrete stain so it’s made to be used outside. If you do it please send me a before and after picture, I’d love to see it on the outside of a home!! Ok I LOVE this idea!!!! I have a fireplace……an UGLY fireplace!!! I live in a modular home and the fireplace is like prefabricated concrete rock look alikes. Some are blue-ish and some sort of white-ish then some are almost black. Just hate it!!! I have red in my kitchen which is just off the family room. Want desperately to make my fireplace not such an eyesore! HELP!!!! Just wondering what my options might be if I’ve already painted my brick fireplace. Can I put the stain over top? Hmmm, you could try. If it were me I would try to sand off most of the paint and then sand it. Any ideas on how to clean off excess concrete/mortar from bricks? I think the brick guys didn’t wipe it off enough when they did the brick work….. thanks for your help! I would use a straight edge scraper or razor blade, if the pieces are small. Can this technique be used on a tiled kitchen counter and backsplash? If not…any suggestions? I wouldn’t use it on the actual counter but you could definitely do it on the backsplash! I have a fireplace that has black grout. I want to stain the brick and get rid of the black grout. What would be the best way to do this? Thanks. If it were my fireplace I would white wash the grout and stain the brick. I think lightening up the grout will make it look more modern. If you want to get the original color back to your pavers you should clean them with a pressure washer. This trick will stain them to whatever color your choose. It’s totally made for outdoor use because it uses a concrete stain which is made for outdoors. Im super happy to have found this. We are updating our living room and I hate painted brick but I also hate the color of our brick….im so excited to stain it using this method!!! Ill take before and after pics! Great tip using concrete stain on brick. I have a customer who used wood stain on his stamped concrete. I think it would be the same finish. The best part of the wood stain on stamped concrete is that it was not as slippery as the normal sealer that is used on stamped concrete. I have a brick wall in my laundry room that the previous owners painted white (boo). Can I stain over the white paint, or how do I restore it back to brick? So happy I found this! I stained our brick wall surrounding our fireplace and it looks great! Where can I send you a before and after pic?? Yay! I’m so glad you took before and afters!!! Email me at askannamoseley (at) hotmail (dot) com. I was wondering what’s the difference between the semi-transparent and the solid color stain? I’ve been reading that several people used semi-transparent and it looks great. However, the people at HD told me to call Behr to double check. I did and they told me that the semi-transparent wasn’t meant for vertical surfaces so I should use the solid color stain. I want my fireplace to look newer and bolder but still natural. I’m afraid the solid color will look more painted on. Any thoughts? Have you noticed any real drawbacks of using semi-transparent? I recently went to home depot and got the exact stain you have photographed to also stain my fireplace and I have put 2 coats on so far and haven’t noticed a change. I’m wondering if im doing something wrong since there are so many wonderful before and after pictures of everyone using this same method. Also from your photo it looks like the brick instantly gets darker the moment you paint that and its not happening with mine. If you could tell me want you think i’d really appreciate it, thanks! This was just what I needed! Thank you. I have an old fire place and have not been able to figure out what to do with it! I am doing this, this weekend. Thank you for the information. I have a stone fireplace and it needs a facelift…any ideas? Can you email me a picture? I’m a visual person. 🙂 My email is askannamoseley (at) hotmail (dot) com. What an awesome idea! Thank you for sharing! I have a fireplace that the previous owners painted white…would I be able to do this and just use stain over it??? Thanks! You can try. I would sand some of the paint off first so that it gives it more character. What about a clear coat or something to go from dull to more “clean” looking. There are a couple of those I like the color of the brick better before, but it needed sprucing. I am still considering painting my brick. Going darker never seems like a great idea. If I buy the Behr concrete stain, does it come in Loden or do you have to have it mixed? They will tint if for you, similar to paint. I’m really excited about trying this. However I’m concerned because the brick on the front of my house is VERY textured. Do you think it will turn out as nice as your examples? what type of brush should I use? Some of the brick on my fireplace was really old and very textured also, I think it will turn out just fine. You could always try it 1st in a spot that isn’t very visible. 🙂 I wouldn’t use a natural bristle brush, I would buy the other kind because it’s more durable. I would LOVE to see a picture when you’re done! We have a floor to ceiling barn-door-red brick fireplace. Is there a stain that you think would tone down the red-color of the brick? I was thinking of white-washing it, but so many people are against painted brick and we want to be able to sell the house in a few years. What do you think? I definitely think staining the brick is a much more natural-looking way of updating brick. The brick on our fireplace was really red, and ugly before we stained it. I think probably any color of stain would be an improvement. 🙂 I would try to stick with the more tan/brown colors though, nothing colored or orangey. Will this work on outdoor brick? Just did this to my fireplace today! Except in addition to using concrete stain for the brick I also used an exterior concrete paint for the grout and it looks like a brand new fireplace! Awesome!!! I love hearing this!!! I want to do this on my parents home that my husband and I bought before they passed. He says NO but I hate the Pink brick from the 50’s! So thanks for showing him it can be done! I REALLY like your tutorial on painting the brick! I have an entire WALL of brick where my fireplace is…and I would like to do this. Only question is…..what if the brick is multi-colored? Will it all stain the same….or will I still get a mottled effect, as opposed to making it all look the same????? I appreciate you time…thanks! I would love to stain the brick at my house! However the brick has white specs all over it, will this effect the stain? Could I do the same on exterior brick post, what would I need to put on over it to protect it from the elements? Can you please email a picture of the walls you are referring to? Anna is very visual and will not be able to suggest anything without seeing it first. You can send the pictures to askannamoseley at hotmail dot com. I want to paint my orangey red brick house gray, any ideas on how to do that? Have you researched white washing it? That might work? I’ve never done it before but I’ve seen lots of nice before/after pictures. Hey Anna! Have you ever used this method to stain stone? And what were your observations/results? Thanks! I personally have never stained stone with it but I’m sure it would work. It’s a concrete stain so I think it would stain just about anything similar. What are you going to stain? Hi Jennifer I saw your post on ask Anna about you wanting to stain your stone fireplace. Did you ever do it and do u have pics? I would love to see what u did and used. , I have a 70’s sandstone fireplace and hate the look of it and was thinking of staining it also. Could you please clarify the process? With the roller, you roll right over everything including the grout? And use the brush just for harder to reach bricks where you can’t use a roller as easily? I’m having trouble understanding when to use a roller and when the brush and whether it’s okay to brush over the grout? Thanks! My firer place is multi colored, will 1 stain work for all the multi color bricks or do I need a separate stain for each brick to keep the colors separate? One stain color will work for everything. You can see in these before and after pictures that even really multicolored fireplaces were evened out with the staining – https://askannamoseley.com/how-to-update-brick/. How would I stain/paint a brick pattern on my concrete patio? Without it peeling off? I would like to paint in a brick pattern leaving the concrete grout lines grey. Hi, Maxine! I’m Anna’s assistant, Bethany. Thanks for your inquiry. I just want to make sure that what you’re wanting to do is tape off your concrete and stain a brick pattern on to the patio; is that correct? If so, then yes, the stain is made for outdoors and you could use it on the concrete patio! Anna has not yet painted concrete, but if you are wanting to use the staining product she mentioned, then Anna does recommend that! Hope this helps! What could I use to first de-saturate the dark bricks so I can then restain in lighter colors? I’ve never done that but you could try doing a white wash on them. So stains should work over a whitewash? Hi! I was wondering about the use of the stain inside the firebox? I was worried about the higher temperatures sending a chemical haze into the room. Thoughts? I don’t have any ideas about whether or not that’s ok. I would talk to the experts at the hardware store and ask them. Sorry. Anna I have tyndal stone on the front of my house that I want to stain a dark brown, My question is do I need to treat it first with something and where can I buy it, I live in Winnipeg. Hi! I am considering staining my fireplace this weekend. I like the look of brick fireplaces that have variant colors of brick (I think that’s called “Old Chicago Brick”). My current fireplace has multiple colors (just all outdated-yellowish colors). Would buying one stain (if it’s semi translucent) make the finished product have multiple shades or would I need to buy multiple colors of stain and paint various bricks different colors? If you like the “old Chicago brick” look you might consider painting the brink instead. Staining it will mellow out the current color and make it look more uniform, it’s not going to give you big variety in the colors. Hi would like to know if u have tried staining fireplace on sandstone fireplace or have pics of someone who did. Love to do this myself. Nervous though. I have a small ranch with the bottom an orange brick. My builder recommends concrete stain to whitewash. Can I tell me a pretty Sherwin Williams creamy white to add to stain? It is a beach house with brown roof and sandy light beige color? Thanks. Have you heard any results from people who tried staining over painted brick? And would you recommend wood or concrete stain?